PA claims Israel didn't really cancel construction tenders announced several weeks ago, threatens to end talks. The Palestinian Authority (PA) is threatening once again to pull out of the peace talks with Israel over its plans to build in Judea and Samaria. Channel 2 News reported on Sunday that the PA is accusing Israel of not having really cancelled tenders that were issued several weeks ago for 20,000 new homes in Judea, Samaria and Jerusalem. Prime Minister Binyamin Netanyahu reprimanded Housing and Construction Minister Uri Ariel over the construction and cancelled it, but the PA is now claiming, according to Channel 2, that the announcement of the tenders appeared as “active” on the Housing Ministry’s website until at least this past Thursday. This, the PA is claiming, is a violation of a guarantee by the United States, which had promised the PA that these tenders were null and void. The report said that PA officials have recently turned directly to Secretary of State John Kerry and told him that unless the tenders are canceled, the negotiations will end immediately. 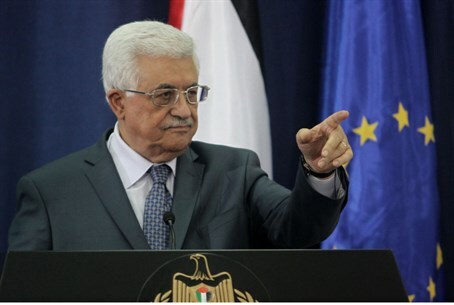 Several weeks ago, after the leftist Peace Now organization exposed that the new tenders had been published, PA Chairman Mahmoud Abbas threatened that unless Israel cancels the tenders he would end the ongoing peace talks. PA negotiator Saeb Erakat had told AFP att the time that he had been given the job of passing the ultimatum to the Arab League as well as the U.S., EU, Russia, and UN. The PA has repeatedly slammed Israel’s planned construction in Judea, Samaria and Jerusalem, despite the fact that it was informed in advance that Israel will continue to build as talks continue. The areas in which Israel plans to build are areas that even the PA has previously accepted will be part of Israel in a future deal. The peace talks restarted in July, but so far little progress has been made in talks and there is a wide rift between the positions of the two sides. PLO official Nabil Shaath admitted on Friday that talks have tanked, but the PA would continue with them for the sole purpose of achieving the release of all the terrorists being held in Israeli prisons, and which Israel had promised to release as a “gesture” to Abbas. Israel has already released two groups of terrorists; both groups included several terrorists convicted of notoriously brutal murders, including the death by fire of a young, heavily pregnant mother and her three children, and the deliberate slaughter of elderly Holocaust survivors. The Supreme Court gave the go-ahead to both mass releases. The freed terrorists were given a warm welcome in Ramallah that included a pledge of lifelong financial support from the PA.